This AP Jules Audemars Perpetual Calendar watch is a beautiful example of watchmaking art. It features day, date, month, as well as Moon Phase displays, all in a classic 36 mm case. This marvel of complications was recently serviced by the company and was restored to it's original "as new" condition! It comes complete with original AP WINDING box, 18K yellow gold setting stylus, and AP service warranty card. 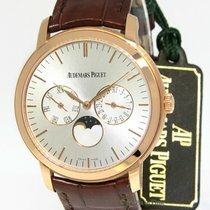 Compare the value to modern high end Perpetual Calendar watches, priced at $60 to $100K. A perfect complicated time piece to add to or start your watch collection! The pictures are of the actual watch in our inventory. We NEVER cut and paste stock photos for any of our offers.